It is no secret that the latest and greatest iPad will have 4G, but apparently there is still questions about it. Representatives from Verizon and AT&T sent tweets this morning that raised more questions than they answered, leaving us concerned that both companies had decided not to allow the hotspot capability at all. 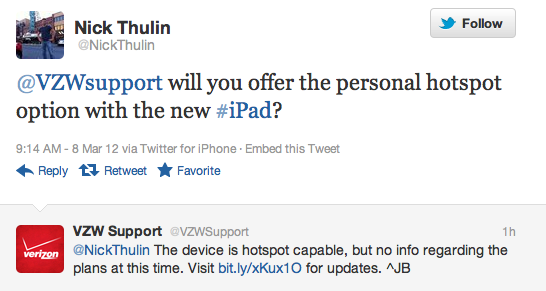 After reaching out to the carriers, however, we're able to shed some light on the subject: Verizon killed the rumor, telling us it has "every intention of supporting Mobile Hotspot on the new iPad," while AT&T stated that it is "working with Apple to enable this feature in the future, but we currently do not offer it." So basically that means that Verizon is all set to start next week when the tablet ships, while AT&T and Apple are still sitting down talking things out. Also, in regards to pricing, you will not have to pay extra to have the hotspot feature. You will use the data that is already on the plan.